We know how Warrior is going to end almost as soon as the movie begins, but that sense of inevitability doesn't dilute the film's power. This is the story of two estranged brothers who both compete in an international mixed martial arts (or MMA) tournament and nobody will be surprised by the fact that they end up facing each other in the climactic duel. We know exactly where the film is going, but it's hard to gripe about its predictable nature when we're so emotionally involved in the onscreen drama. In fact, there's something comforting about clichés and familiar narrative trajectories when they are delivered with a genuine sense of skill and conviction, and Warrior is a textbook example of genre dynamics working for a picture rather than against it. 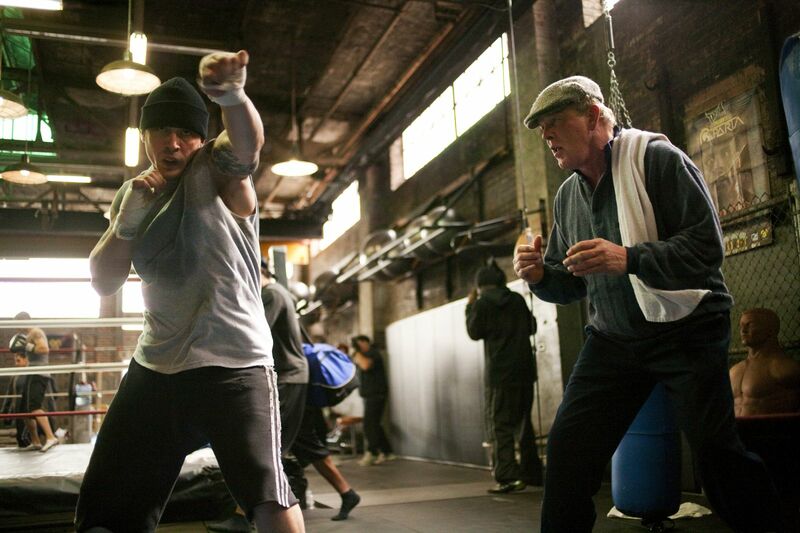 Like David O Russell's The Fighter, this film revolves around familial tensions. Tommy (Tom Hardy) is an ex-soldier who left his squadron in mysterious circumstances to return home to Pittsburgh. He find his father Paddy (Nick Nolte) a changed man; refusing his son's offer of a drink, Paddy announces that he has been sober three years, with the suggestion being that his boozing was a key element in the family's past heartbreak. Paddy has no contact at all with his other Brendan (Joel Edgerton), a teacher and family man, but all three men are drawn to the same tournament. Brendan, a former fighter, has already been earning some cash through illicit, late-night bouts, but he needs the prize money this competition offers to save his home from repossession. Tommy wants his father to coach him into shape, but it's hard to see why he needs such training – he walks straight into the gym and lays out their top competitor with one punch. Tommy is a coiled spring of pure, animalistic aggression. He storms into the ring with none of the posing or backing music the other fighters employ, and after ferociously tearing into his opponent, he storms straight back out, not even hanging around to hear the referee call the result. Hardy is terrifyingly believable as the snarling Tommy but it's Edgerton who really impresses, with his more textured character allowing for a more nuanced and empathetic performance. He's the underdog who makes good in the grand Rocky tradition, and his scenes are lent more colour by the excellent portrayals of those around him – his wife (Jennifer Morrison), trainer (Frank Grillo), school principal (Kevin Dunn) and his excitable students. The film has been co-written and directed by Gavin O'Connor, whose mediocre previous features didn't hint at the kind of control and storytelling sense that he displays here. He impressively utilises his locations – both the working-class Pittsburgh background his characters hail from and the Atlantic City backdrop to the main event – and he makes every scene count in some way. The film maintains a remarkable sense of narrative momentum, with the second half of the movie dividing time between emotional confrontations outside the ring and the vicious, thrillingly depicted fights inside it. Warrior runs to 139 minutes, which initially seems excessive, but it doesn't feel overlong when you genuinely care about the outcome of each bruising encounter. We care because it feels like Warrior possesses a beating heart beneath all of that brawn, and that's exemplified by nobody more than Nick Nolte, as the patriarch desperate to make amends for his past mistakes. There's a devastating authenticity to Nolte's portrayal of Paddy, with so much pain and regret on show in his watery eyes and halting delivery. Combined with Edgerton, Hardy and the gripping, richly atmospheric fight sequences it creates an extraordinarily powerful brew. Conventional it may be, but Warrior is also irresistible.